Iconic cars are always a big lure for dealerships, with admirers likely to flock to the showroom to catch a glimpse of the famous vehicles. That has certainly proved to be the case in Dubai, where the Batmobile that was featured in the Dark Knight Trilogy has turned up for sale. 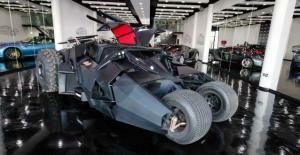 Priced at Dh3.68 million (£600,000), the car has got fans of the DC Comics hero very excited as they can pop into the car dealership and see the Batmobile sitting alongside Rolls Royces, Ferraris and Aston Martins. The car dealership selling the car, meanwhile, will have to take extra care in amending its road risks insurance and motor trade insurance policies so it has suitable cover for the Caped Crusader's tank-like vehicle. The Batman Tumbler Batmobile is powered by a Chevrolet Corvette V8 5.7 litre petrol engine that produces over 500 horsepower and can reach top speeds of 250km/h. It can also be registered to legally drive on the UAE roads, according to the owner. At rear of the vehicle there is a ‘jet engine’, which emits flames at the flick of a switch thanks to propane tanks located behind the radiators at the side of the car. The Batmobile also comes with a stereo with Bluetooth and iPod integration as well as a CD/DVD player, and five driver assist cameras, Emirates 24/7 reported.